Esta semana pasada, mi compañero y yo comenzamos un ayuno de inglés. Somos los únicos elderes en nuestra zona que hablan español, entonces hablamos mucho inglés durante el día. Por este razón, decidimos hablar puro español cuando no estamos con otros misioneros de inglés. ¡Fue muy bien para practicar más español! Puedo ver mi español mejorando poco por poco por medio del don de lenguas. [TRANSLATION: How are you my friends? 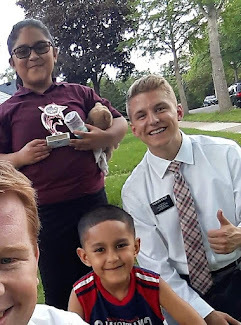 On Wednesday we had new missionary training, so we carpooled up there with 2 other missionaries and drove 30 minutes to the mission home in Bloomington. 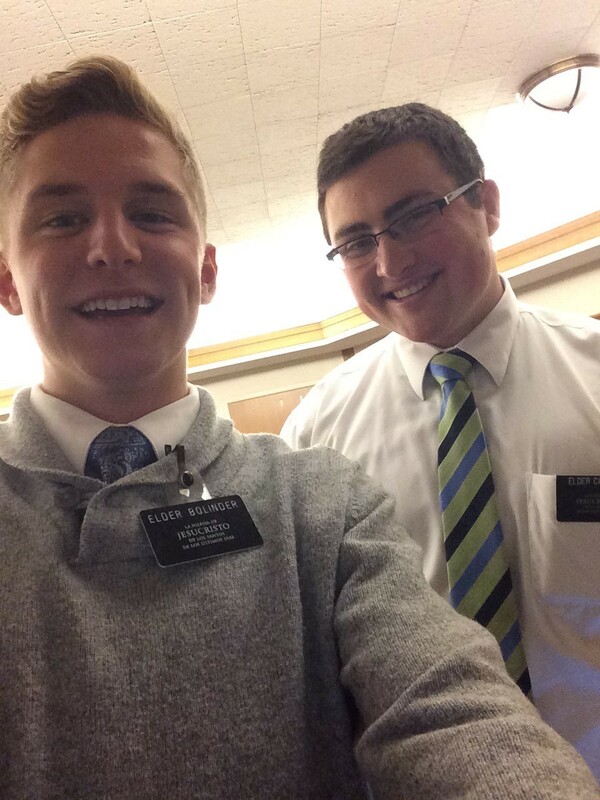 There were about 7 other new missionaries along with their trainers. I met Elder Callan's good friend Elder Vang, and he's actually a Hmong speaking elder! It sounds similar to Chinese and it's sweet haha. In the MMM we also have Chinese speaking sister missionaries and other missionaries who speak Karan which is a dialect from like Myanmar or something, it's pretty amazing! But, I was the only new Spanish speaking missionary there. We had many training lessons on how to plan and teach more effectively, and better help others come unto Christ. One thing that really struck me was a story that was shared. It was about 3 people who were waiting in line to be interviewed to enter into Heaven. They are all asked the question, “What do you know about Jesus Christ?” The first guy says, well he was an honorable man who taught peace. And the interviewer showed him to the door on the left. Then the second guy gives his answer, he is the Son of God and he performed many miracles and lived a perfect life, and he atoned for the sins of the world. The interviewer then takes him to the door on the right. Then the last person walks into the room and is asked the question by the interviewer, what do you know about Jesus Christ? And he fell to his knees and said, my Lord my God! This story really shows the difference between knowing about our savior Jesus Christ and increasingly coming to know him. There was an amazing talk given in the recent October General Conference by Elder David A. Bednar, a member of the Quorum of the Twelve Apostles entitled "If Ye Had Known Me" and I encourage you all to read it! Thursday, we had another all-day meeting! Two other zones joined us for a Christmas Zone Conference with the mission president and wife. We received more training, had a Christmas devotional, and ate an amazing ham and potato lunch! Afterward, we got to watch a movie! We watched “It's a Wonderful Life” and had root beer floats! I've seen parts of it before, but this was my first time watching it all the way through. It was such a great movie and really made me appreciate my life and my family, and how blessed I am to have grown up in the circumstances that I did. I've seen the hand of God guide my life and I know that he has a plan for every single one of us, and he is always there when we turn to him with humble hearts! As of right now, we are struggling with our progressing investigators. All transfer, it has been really difficult to get our investigators to attend church. For some of them, it's the only thing holding them back from baptism. Almost all of the Hispanic people we teach work on Sundays, so it's a big struggle to convince them to come to church. We have been praying fervently for our investigators to find new jobs and for better church attendance, and we would ask for your help in praying for our investigators. However, we have had more success with contacting, especially with the new Christmas Video! We usually go door to door in apartments with Hispanic populations, but on Wednesday night we weren't having much success. So, we felt prompted to stop inside the local grocery store and find people. We walked around for a bit and sure enough we ran into this lady named Pati from Mexico and started a conversation with her in Spanish. I was a little out of my comfort zone trying to strike up a conversation with a stranger in Spanish lol but it went well. We ended up sharing the Christmas message with her and set uo a return appointment! She is in the Spanish sisters’ area so we gave her as a referral. But, it was a great experience with contacting and following the promptings of the Spirit! We've officially hit Minnesota winter haha. On Saturday, a storm rolled in and dumped 7 inches of snow over night! The temperature was also in the single digits all week with wind chill dropping in the negatives😅. Next weekend we get even more snow with a high of -2 so wish me luck haha! View from Apartment. Let it Snow!